(New!) Susan Povich of Red Hook Lobster Pound fame, is back this summer not only at the Bay 9 Pavilion with more delicious seafood centric fair such as fried shrimp and clam rolls, but also at the Bathhouse with a classic raw bar of raw shellfish, shucked and served on ice. After a successful inaugural season of sellouts last season, chef Michael Fiore, also a Rockaway native, returns this summer with a menu featuring pizza melt grilled cheese sandwich with Calabrian Salami, Cuban Grilled Cheese and “Salty Dog”. is common on the north shore of O’ahu, Maui and the Big Island of Hawaii. Hang loose and cool down at Riis. Regularly ranked as the No. 1 ice cream shop in New York City, if not the world, we are thrilled to have Ample Hills back at the Bathhouse. Find them directly to the east of the Bathhouse bar. (New!) 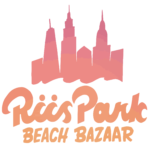 Rachel Sito, the creator of the EverythingRockaway app is creating a family space at Riis Beach with a snack station, scoopable candy bar, tons of games for kids and adults, pop-ups vendors and beach umbrella and chair rentals. Bring the fam! (New!) We’re really excited to have this innovative, super tasty and popular popsicle stand at Riis for the first time this summer. People’s Pops use only the best fruit from NYC greenmarkets, have inspired flavors and are handmade in Brooklyn. Also! we can’t wait to try their Poptails – such as the Dainty Girl with a watermelon mint pop, sparkling water, mint and lime garnish. (alcohol sold separately at the main Bathhouse bar). (New!) This Rockaway based healthy meal home delivery startup is taking over the eastern Bathhouse kiosk focusing on salads, wraps plus whole fruit and vegetable juices. Get healthy at the beach! At the helm of the of their kitchen is Julia Steinberg formerly of Bay 9’s The Dropout. We’re thrilled to have Julia back at Riis! Fresh ceviche, all day, every day at this delicious concession stand. Not to be missed for seafood fans. Also on the menu, other Peruvian staples such as Quinoa with Shrimp and Chicken dishes. Get your beach day started at this beach cafe that specializes in iced coffee and teas, avocado bagels with savory spreads, pastries and granola. Located right next to the Camp Rockaway entrance. (New!) Joyce and Danny Chen of Rockaway’s O’sake Ramen House are coming on board to the Bathhouse’s eastern most edge and will be focusing on bubble tea, chia fruit drinks and Asian fruit desserts. How refreshing! Can’t wait! Rockaway local Susan Povich, of Red Hook Lobster Pound fame, is back at Bay 9 this summer with more delicious seafood centric fair such as fried shrimp and clam rolls. Claudette has been cooking under the tutelage of various culinary experts for over 35 years. Traveling throughout Europe and Northern Africa, Claudette has honed her skills as a culinary chef. She has spent the last 12 years lovingly feeding the community of Rockaway. Featured on her menu this year are cauliflower bowls, select handful of pastries, and Claudette’s house-kegged nitro cold brew coffee. (New!) There’s a new kind of BBQ in the Rockaways this summer. Aaron Saurer and James Zamory’s passion for slow cooked meat, patient braising and intricate sauce work while working at The NoMad, Betany and Roberta’s led to their creation of Carnal – a union of Kentucky slow cooking and New York eclecticism delivered with the precision of a Michelin starred restaurant. We’re thrilled to have these guys on board. Enjoy! After a successful inaugural season at the Bathhouse last summer, chef Michael Fiore, a Rockaway native, took over the offseason operations at Bay 9 with a rotating menu focused on American and Italian classics. Meatup will be continuing their Bay 9 residency, Meatup will add this second summer Riis location dedicated to classic beach fair of burger and dogs. Yummy! A second location at Bay 9, in addition to the Bathhouse. Best Ice cream and sorbet around! Childhood friends Mikey Reen, Dylan & Ryan Sirgiovanni founded their coconut stand to bring the vibe and feel of tropical beaches to their little strip of urban paradise. They are all born and raised Rockaway natives. Their Young Thai Coconuts are always fresh and cold. Superfood mousse dessert made locally in the Rockaways with bare ingredients. Frozen 100% whole fruit on a stick dipped in dark couverture chocolate. Wood fired pizza returns to Bay 9 West! Dave Scarlow is bringing his signature Neapolitan style pizzas to Riis Park and we’re stoked! (New!) Featuring home-made Colombian food with a speciality in Quinoa and Arepas with traditional meat and vegetarian toppings. Delicious AND nutritious! (New!) Domenic Boero and Tyler Wright, managers at Rippers and the 86th Street Boardwalk concession are starting their own restaurant dedicated to the classic California roadside burger. Also on the menu, veggie burgers, fries and wings. Find tem at the retrofitted cargo container at the Bay 2 concession stand, on the far east end of Riis. (New!) Based in Redhook, this new family owned gelateria hand crafts batches of Gelato with milk from the Hudson Valley and sorbetto (vegan) from fruits and veggies also sourced from close by. Enjoy the ancient Italian art of home made Gelato oceanside! Warung recreates the Bangkok street cart experience with delicious Pad Thai and Thai BBQ made in a way that honors Thai traditions. Find them on weekends in their truck at Bay 14, on the far west end of Riis, closest to Fort Tilden. Traditional and inexpensive Mexican fare inspired by the flavors and ingredients of Oaxaca. New! this season, the Oaxaca truck has been converted to a retrofitted cargo container with a cantina inside featuring Mexican frozen cocktails.